WHAT: Oklahoma Spirit Ride ceremony and processional to raise awareness of the need for Oklahoma drivers to Slow Down and Move Over when emergency responders are along roads to assist drivers; tow truck drivers are among the vulnerable with a death occurring nationally on average every 6 days. Dozens of professionals from the police, fire, EMS and towing services will attend Tuesday’s event. WHEN & WHERE: Tuesday, 9/18, 10 a.m., ceremony at Oklahoma Towing & Recovery Inc., 600 N. Ann Arbor, followed by a police-escorted processional with the casket and trailing tow trucks and emergency service vehicles through Warr Acres, Bethany, Yukon, Mustang and then east on Highway 152 to I-240 where it will end at the former Crossroads Mall. (See attached map of route.) The public is invited to line the route to pay tribute to those who have lost their lives and to honor those who continue to serve in these high-risk roles. IT HAPPENS HERE: In the early afternoon of Jan. 26, a 43-year-old wrecker driver was killed in Rogers County while assisting a broken down vehicle on the shoulder of the Will Rogers Turnpike. Officials said all drivers were out of their vehicles when a semi-truck swerved onto the shoulder, hitting the driver of the wrecker who was pronounced dead at the scene. Bryan Hull, owner of Oklahoma Towing & Recovery, has been hit two times in his career and survived injuries. He will be available for interviews about the concerns of all in his profession. IT’S A LAW: In all states, passing vehicles are required to move over one lane when approaching any incident where emergency lights are flashing and tow operators, police, fire fighters and emergency medical technicians are working. According to the Federal Highway Commission, 70% of the motoring public is unaware of the law requiring drivers to move to the left lane when any vehicle is stopped on the side of the road. Others simply ignore it. WHAT YOU’LL SEE: Spirit Ride ceremonies feature the colorful, custom-built Spirit casket, twirling rain sticks, color guards, and music performed live in tribute to first responders who have been struck down while working on the roadway. The ceremonial casket, named Spirit, was built painted by an artist famous for his intricate designs air-brushed on wreckers. 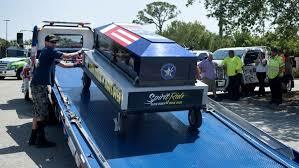 The scenes depicted on the casket represent all first responders and the perils they face on the highways. Color schemes represent patriotism and tragedy. NATIONALLY: Spirit Ride ceremonies and processions traveled through 2,000 municipalities in 2017. The event is slated for 160 more cities this year.